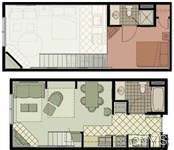 This unit is one of the larger units with a loft and 2 full baths and is located on the 5th floor of Hope Lake Lodge, this is deeded fractional ownership of 13 weeks per year one week per month tied to a time of use calendar. Each year the week rotates forward by one week giving all owners the opportunity to enjoy all the holidays over a four year period. Hope Lake Lodge is a full service resort offering restaurants, a spa, a waterpark, an arcade, skiing and an adventure center. Fun for Everyone at a great price!